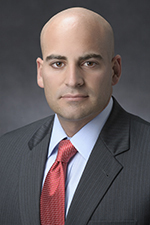 Salvatore Puccio is a Partner at Garfunkel Wild, P.C., which he joined in 2008. He is a member of the firm’s Litigation and Arbitration Group, which advises clients on a host of litigation issues in both federal and state court, and Appellate Litigation Group, which includes federal and state appeals, including argument. He is also a member of the firm's Employment Law Group. Sal focuses his practice on complex commercial litigation matters and has represented clients in breach of contract matters, managed care disputes, partnership disputes and breakups, antitrust matters, construction litigation, landlord/tenant disputes, and employment disputes. Sal also has particular experience in counseling clients concerning the employer-employee relationship including the defense of age, race, gender, national origin, and disability discrimination and sexual harassment lawsuits, compliance with workplace regulations and employment statutes, and wage and hour lawsuits. Sal previously served as the General Counsel for Breast Cancer Help, Inc., on a pro bono basis, and was an adjunct professor at New York Institute of Technology from 2005-2008, where he instructed students in Political Science and History Courses.